From the 1960s, when women began working together to end gender-based violence, to well into the twenty-first century, attitudes and practices have shifted in important ways, yet this social justice project is far from complete. While feminist resistance has gone public in unprecedented ways, institutional responses often lag far behind. This chapter focuses on medical contexts, arguing that gendered violence, a neglected topic in bioethics, constitutes an important issue for the field, one urgently in need of intersectional feminist bioethical analysis. Moreover, the chapter argues that this analysis requires intersectionality, such as including transgendered women and genderqueer people in the focus, while addressing race, class, disability, and other vectors of oppression. Complex inegalitarian dynamics persist as pervasive factors in healthcare, compounding the harms of violence itself when treatment is sought. Mainstream medicine often treats the symptoms of violence while ignoring or obscuring the causes. 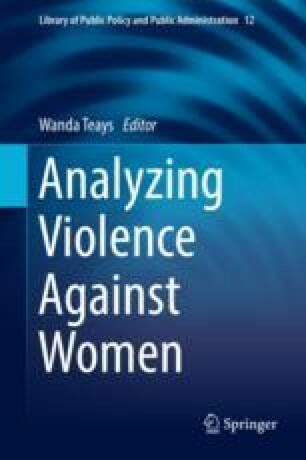 However, a feminist analysis provides guidance based on the tenets and practices of movements against gendered violence. Medical providers have a distinctive opportunity to intervene in the crisis of gendered violence, and movement-based principles point the way to equitable and effective medical responses. A significantly revised and updated version of Abby L. Wilkerson: ‘“Her Body Her Own Worst Enemy’: The Medicalization of Violence against Women,” in Violence against Women: Philosophical Perspectives. Stanley G. French, Wanda Teays, and Laura M. Purdy, eds. Copyright ©1998 by Cornell University. Used by permission of the publisher, Cornell University Press. I thank Lisa Heldke, Timothy Murphy, Pat McGann, and the late Sandra Bartky for painstaking readings of earlier versions of this paper, and very helpful suggestions. The chapter is also informed by the women of Sarah’s Inn, a domestic violence service agency in Oak Park, Illinois, who shared many valuable insights and experiences when I volunteered there from 1988 to 1990. Arkles, Gabriel. 2018. Making space for trans people in the #MeToo Movement. American Civil Liberties Union. ACLU.org, 3 April. https://www.aclu.org/blog/womens-rights/violence-against-women/making-space-trans-people-metoo-movement. Bhattacharjee, Anannya. 2001. Whose safety? Women of color and the violence of law enforcement: A justice visions working paper. American Friends Service Committee on Women, Population, and the Environment. https://www.afsc.org/sites/afsc.civicactions.net/files/documents/whose%20safety.pdf. Feminist Bioethics. 2015. Stanford encyclopedia of philosophy. December. https://plato.stanford.edu/entries/feminist-bioethics/. History and Development of SANE Programs. (n.d.). Office for victims of crime training and technical assistance center. SANE Program Development and Operation Guide. https://www.ovcttac.gov/saneguide/introduction/history-and-development-of-sane-programs/. Lew, Pamila, et al. 2010. Victimized twice: Abuse of nursing home residents, no criminal accountability for perpetrators. Disability Rights California, Investigations Unit. 2010. https://www.disabilityrightsca.org/system/files/file-attachments/548801.pdf. McGann, Patrick. 2015. It’s on us: Healthy masculinity and sexual assault prevention. Sojourners, 20 March. https://sojo.net/articles/violence-against-women/its-us-healthy-masculinity-and-sexual-assault-prevention. “Monitoring Use of Restraint and Seclusion in State Psychiatric Hospitals.” 2014. Disability rights California. https://www.disabilityrightsca.org/stories/monitoring-use-of-restraint-and-seclusion-in-state-psychiatric-hospitals. Women’s Health Bibliography. 2016. Center for bioethics and human dignity. Trinity International University. October. https://cbhd.org/womens-health/bibliography.